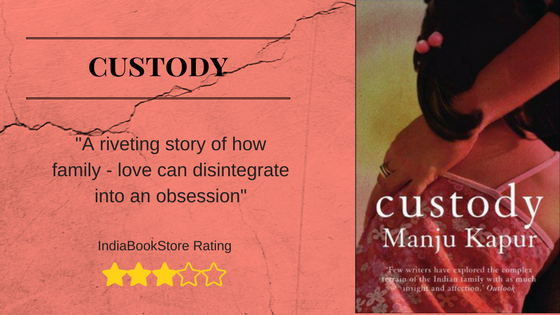 In ‘Custody’ Manju Kapur has tried to explore the finer nuances of a divorce – both pre and post. Not only are we taken through the journey of what leads up to one, but also the repercussions of this as well. The story takes us through the life of Raman, who works for ‘The Brand’, a leading soft drinks manufacturing company. He has this respectable job, gets paid handsomely, and leads a decently content life with his gorgeous wife Shagun, his smart teenager son Arjun and his adorable three year old daughter, Roohi. Parellely, we are introduced to Ishita, who although not strikingly beautiful, is wise, kind and generous. Ishita gets married and leads a happy life, adapting to her new family, being everybody’s favourite. Raman, like a dedicated employee, gets completely absorbed in his work and starts spending even less time with his family. Shagun, after leading a happily married life so far, decides that she is bored of being just a house-wife and now wants to start working. The twist begins with the entry of Raman’s bold and dashing boss – Ashok. For Ashok, it is love-at-first-sight. He manages to somehow convince Shagun that an affair without the knowledge of her husband wouldn’t harm anybody. But slowly the relationship begins to get serious and Shagun is forced to choose. Ishita on the other hand is diagnosed as infertile. The happiness in her married life slowly starts fading away. Her family’s behaviour changes instantly and she ends up being a divorcee. She then begins to channel her energies into social work and leads a comfortable enough life until… she meets Raman. Shagun moves abroad, Raman refuses to divorce her and the case is dragged to court, with each party trying to defame the other. 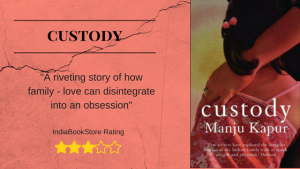 As the title ‘Custody’ suggests – here begins a crude battle for the guardianship of their children; a lethal game where the innocent children get trapped and are torn between their two sets of parents who later re-marry (Shagun-Ashok and Raman-Ishita). Each character has a mind set, unique in its own way, reflecting the modern virtues that we have been adapting. The author manages to create a sublime atmosphere that reveals the various tragedies that a family can go through. The future of the children are at stake. There is screaming, yelling, and all the possible melodrama. Manju Kapur delves deeper to give us an insight in to the mindsets of the children. How a teenager boy misses his father while he applies for admission in a new school, a school where his new step-father has been a legend. How a shy and clingy girl of three is coerced into believing that her birth mother loves her no more. How a brother is turned against his sister. Incidents which evoke strong responses from the reader, where one is forced to think! As we proudly claim to belong to the 21st century, does our culture and traditional thinking change drastically with time as well? In a fierce battle of wills and clash of egos, would you want your children to suffer the consequences? You wanted the divorce; should your children be the victims? Its actually very simple if one has such ambitions then don’t get married and have the kid! Run after your dreams its a lot easier to do without the children..handle it yourself..then once mature think about a family!